Tuberous begonias (Begonia X Tuberhybrida), are blooming perennial plants, especially prized for their ability to thrive in areas with low levels of sunlight. Versatile tuberous begonias are available a variety of colors, including white, red, pink, yellow, orange, and multi-colors. The upright varieties shine in flower beds or borders, and trailing types will cascade merrily over the edges of a patio pot or hanging container. Although tuberous begonias can be fussy, the plants will reward an extra bit of attention of bright color all summer long. Purchase tuberous begonia plants at a garden center or nursery. Choose sturdy plants with healthy, green foliage, and avoid spindly plants with yellowing leaves. Harden off the tuberous begonia plants for a few days before planting them outdoors. Place the tuberous begonias in a sheltered, shady spot for two or three days, then move the plants into morning sunlight for two or three days. After that time, the tuberous begonias will be acclimated and ready to be planted in the flowerbed or container. Plant tuberous begonias where they will get morning sunlight. Avoid planting tuberous begonias where they will be exposed to afternoon sunlight, which is too hot. Be sure the soil drains well, as tuberous begonias will rot in excessive moisture. To plant tuberous begonias in containers, fill a planting container with commercial potting soil, then plant the begonia in the container. The container must have a drainage hole in the bottom, and should be at least 12 inches in diameter. Keep the soil evenly moist, but don’t allow the soil to become too wet, as excessive moisture will cause the roots to rot, or the stem to break off at ground level. Check containerized tuberous begonias daily in hot weather, as containers dry out very quickly. Water early in the day so that excess moisture has time to evaporate before evening. Water at ground level, and if possible, don’t wet the foliage. Fertilize tuberous begonias once every month, using a balanced water-soluble fertilizer, applied according to the directions. Pick off spent tuberous begonia blossoms to encourage the plant to continue blooming as long as possible. Keep the soil around the plant tidy. Remove any dead or yellow leaves immediately, and pull any weeds under the plant. Debris can attract pests and fungal diseases. Dig the tubers after the first frost in autumn. Put the tubers in a dry place for 4 to 5 days, then remove the foliage. Move containerized tuberous begonias indoors in September. Place the container in a cool room and water the plants very sparingly. When the foliage wilts, stop watering entirely. Once the foliage is completely brown, remove the tubers from the container. 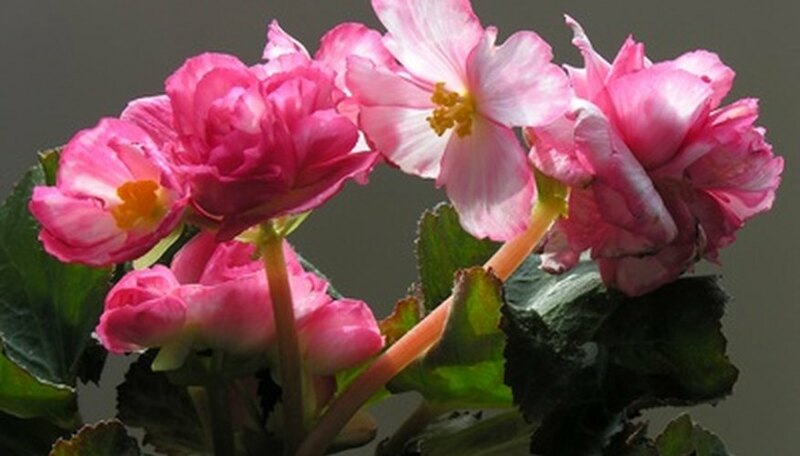 Place the tuberous begonia tubers in a cardboard box or a paper bag filled with peat moss. Store the tubers in a room where the temperature will remain about 50 degrees Fahrenheit. Replant the tubers in the flower bed or container, and resume normal care when all danger of frost has passed in the spring.